The decision to shut down the Hellenic Broadcasting Corp (ERT) and fire its 2,500 staff caused uproar in the country and brought criticism from abroad. Athens said the broadcaster had to be scrapped as part of the major spending cuts, which is the requirement for receiving bailout money from international creditors. The planned new broadcaster will be called NERIT, the government announced on Wednesday. It will be a state-owned, independently-managed public company funded through a special fee. While no official date for the new broadcaster’s launch was officially stated, sources indicated that it may happen sometime in August. 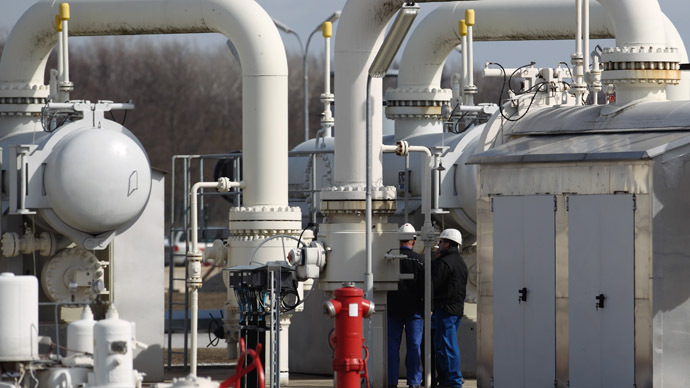 NERIT is to have 1,200 employees when it opens, according to the German magazine Focus. Athens cited lack of transparency, overstaffing and waste of public money as its justification for their condemning ERT. The sudden closure of ERT on Tuesday, which was the first-ever shut-down of a national broadcaster by its government in Europe since World War II, caused uproar in the country and criticism from foreign organizations. 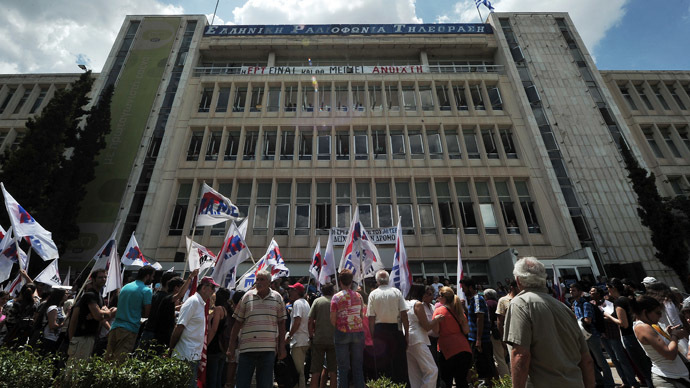 In a gesture of solidarity two major Greek labor unions – GSEE and ADEDY announced a 24-hour strike for Thursday. "We want to show our solidarity to the state TV workers and protest against these unacceptable public sector reforms that the lenders have demanded," the general secretary of public sector union ADEDY, Ilias Iliopoulos told Reuters on Wednesday. The journalists’ union ESIEA earlier announced a strike too to support colleagues from the closed channel. 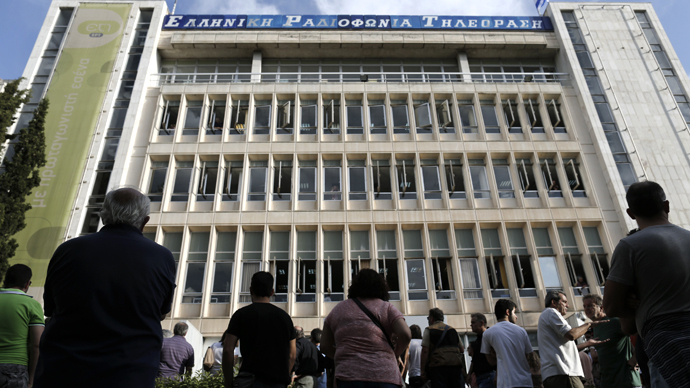 ERT staff members refused to leave the broadcaster’s building north of Athens and have continued TV broadcasting over the internet, long after the radio signal was shut down. On Wednesday, Greece’s fragile coalition government failed to produce a compromise regarding ERT’s closure. Though Prime Minister Samaras’ plan is for a leaner, cheaper version of the state-run broadcaster, its closure has rattled his centre-left allies, PASOK and the Democratic Left - without whom the conservative party has no parliamentary majority. The ERT issue then poses the very real possibility that a broken coalition will be unable to pass key reforms demanded by Greece's international bailout creditors. According to the AP, following an emergency meeting both PASOK leader Evangelos Venizelos and Democratic Left chief Fotis Kouvelis stated that they were committed to keeping the coalition alive. Still, both leaders insisted that ERT be kept open during top-level talks. Meanwhile the European Commission, which is part of the “troika” of investors overseeing Greek austerity measures, distanced itself from the controversy. "The Commission has not sought the closure of ERT, but nor does the Commission question the Greek government's mandate to manage the public sector," European Economic and Monetary Affairs Commissioner Olli Rehn told the European Parliament on Wednesday. "The decision of the Greek authorities should be seen in the context of the major and necessary efforts that the authorities are taking to modernize the Greek economy. Those include improving its efficiency and effectiveness of the public sector," Rehn said in a statement to deputies. Greece is undergoing its sixth year of economic recession, suffering from high unemployment, shrinking public spending and regular mass protest of the disgruntled citizens. 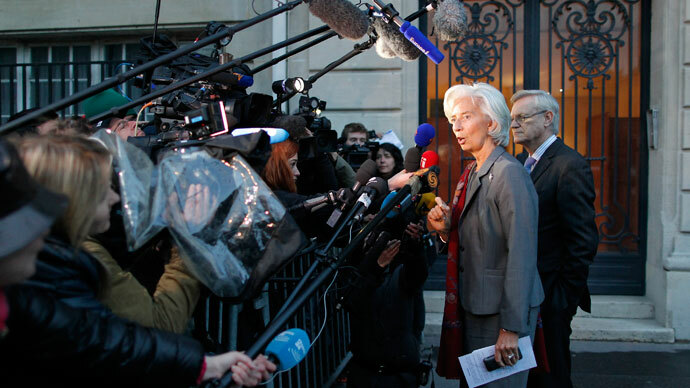 The International Monetary Fund, also part of the ‘troika’, acknowledged in a report this month that it made ‘notable failures’ in its handling of the Greek bailout. The international body said it had underestimated how deeply austerity measures imposed on Greece would hurt the country.